I am sure that most of you must think that all I ever see are fields of corn, tobacco, and tall grass. Barns, dogs, and kids often fill my posts. But, this picture is the real deal. I pass through this caution light leaving my farm to drive into Smalltownland civilization. The intersection, and the surrounding buildings, have been here since I was a kid spending time during summer break hanging out with my grandparents. And, to hear my Grandma Bird tell it, this intersection was here when she was a child and her dad owned the blacksmith shop not too far away. It isn't fancy and it certainly isn't modern, but it provides a sense of comfort in this Farmchick's small town routine. Well, that looks quiet. I just went through an hour of traffic congestion just now ! Enjoy the quiet life, it is a luxury to most people ! i love this! and i love even more that you live in the same town as you did as a child...how special to get to hear your grandmother's stories too of this great little town! now-a-days, too many people are busy moving around, no real roots to anyplace, and i'm one of them...i would have loved to grow up in a small town and still live there! I would really like a line of only five cars! Neat history to an intersection! I can relate to school bus traffic jams..and 5 cars in that jam! I love reading about and seeing your small town charm. You know how to make a girl envious, don't you?? (sigh). If I could convince DH, I'd live in a place with a caution light like that. I am so jealous right now. You have the best of both worlds, farm and field, and a small, blink and missit' town. I love it. This looks like Loradale, Ky,, where I live. We don't have a caution light because too many people thought it would cause a problem. A stop sign only, and we are still having our 3 or 4 fender binders a month. We have to have something to talk about. 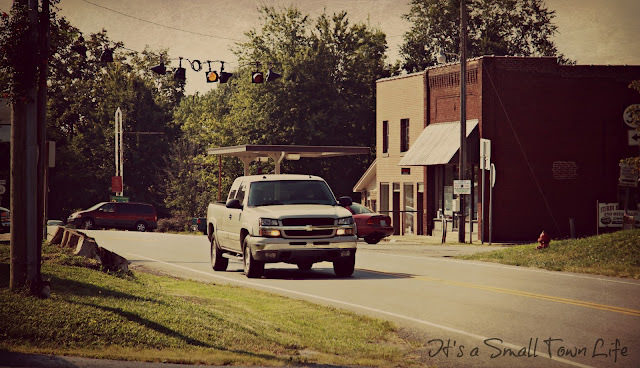 A small town picture that captures the essence of small town life and its charm. Cool! You make me feel like such a city girl! i love this. just as it should be. It's nice to see a city life post. Looks like rush hour. Coming from a very small town myself I find it to be INCREDIBLY charming! Such a sweet little town...I remember when our town used to be like that. And to think, the town has grown so much that we even have a Sonic! oh what joy ! many times one can smell, and even taste, rush hour over here. while having windows at home open. please have you all a good wednesday. Yes it gives a good sense of how life is in your small town....good pic. I can relate. It's why we left the big city and spent most of our adults lives in rural smalltown Mn. Rural America, isn't it great and aren't you lucky. Simple history, I just love it..
wow you have a light...the little farm communities I grew up in and have lived in since didn't have even a caution light! rural life is very different from living in the city...so much I love about it...so much I miss and will never experience again! Small town life is wonderful! We don't even have a stop light in my town! LOL!!! This reminds me of my youth. When I was taking Drivers Ed, we had to drive 45 minutes away to get to a town that had a traffic light to practice going through a traffic light. I had to drive around the block four times to finally hit a red light. It was the only traffic light in that town. Familiar surrounding and familiar ways is extremely comforting. Very cool. Looks likes a nice place. Love small towns- wouldn't trade for anything. Reminds me of the town where I grew up.